Happy Halloween weekend everyone! I’m going to cut straight to the chase today because I am just SO excited about this post! If you didn’t know I am one HUGE Harry Potter geek. I’ll take any chance I can get to hunker down in my comfy clothes and have a Harry Potter Marathon. Harry, Ron, and Hermione were such a huge part of my child hood. This is one 2000’s pop culture phenomenon that I will without a doubt pass on to my children one day! Who else is with me?! I spent my teenage years going to midnight Harry Potter move premiers and reading all of the books over summer vacation! To say these cocktails were a bit nostalgic is an understatement! 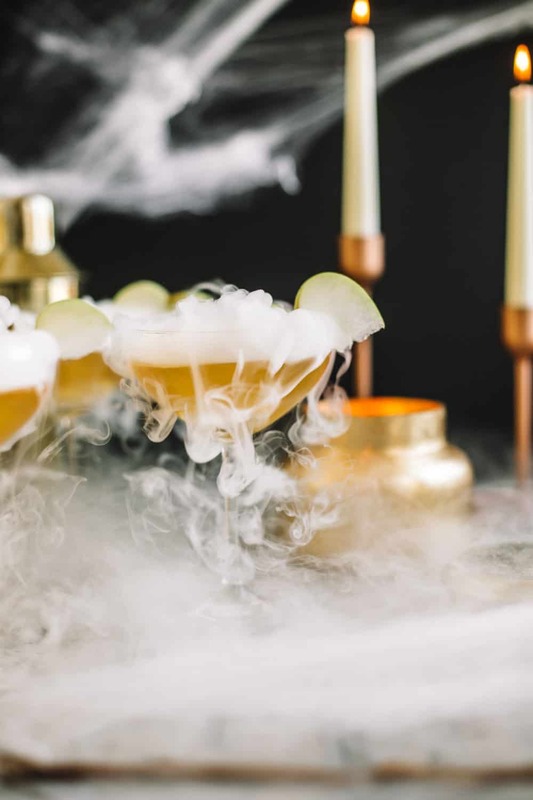 The secret to an ultra cool Harry Potter style cocktail is dry ice! I’m going to tell you a ground breaking secret (and almost embarrassing for me!). This is my first time using dry iced, EVER! Tell me it doesn’t look so amazing in these photos!? I’ve wanted to dip my toes into this scientific foodie world for a while, but I was a little nervous! I had weird preconceived thoughts that the dry ice would explode or I would burn myself but neither of those things happened! The trick to using dry ice is to have some really thick gardening gloves handy (don’t handle it bare skinned!) and a little goes a long way. Each of these vessels was filled with just an ice cube sized chunk for an epic effect! 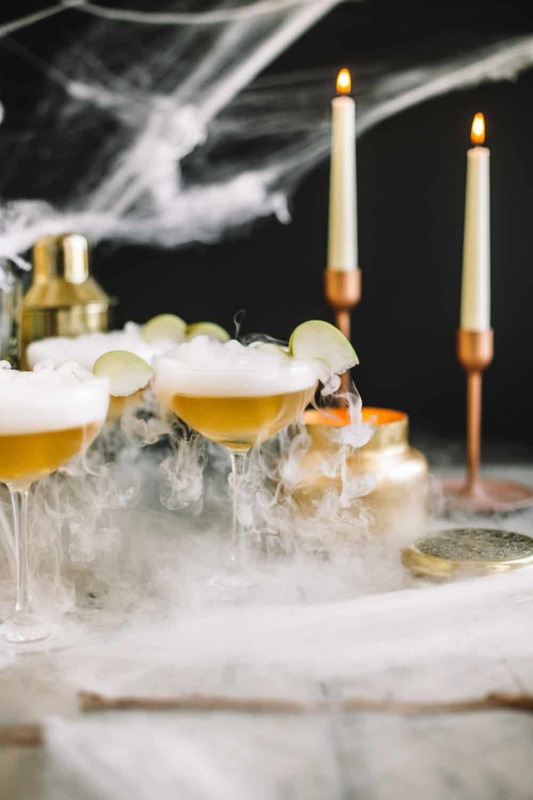 And yes, you can actually drink these cocktails! Just don’t put the actual chunk of ice into your mouth because it could burn you! We picked up a ten-pound block of dry ice from Smart and Final but most grocery stores sell it! Cut off the chunks you need with a charp knife or place the entire block in a warm water filled cauldron. 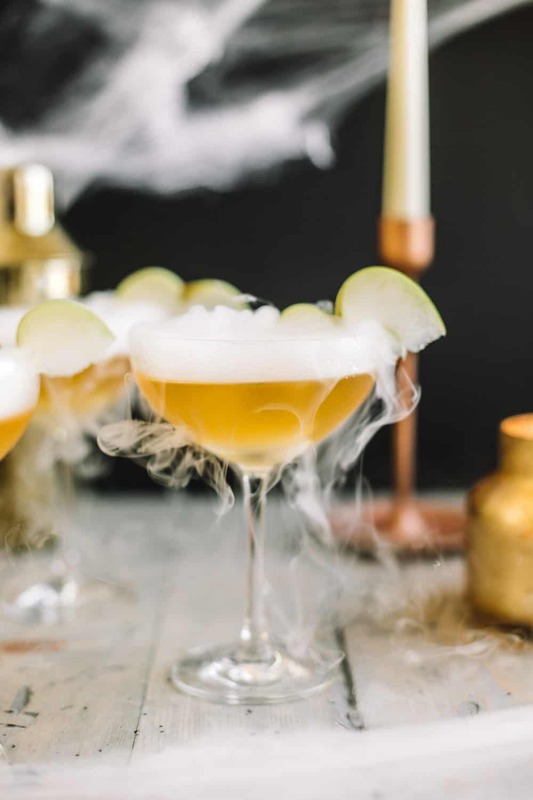 Fill a cocktail shaker with ice, elderflower liquor, vodka, apple juice, honey and lime juice. Shake for thirty seconds. Pour into a coupe or martini glass. 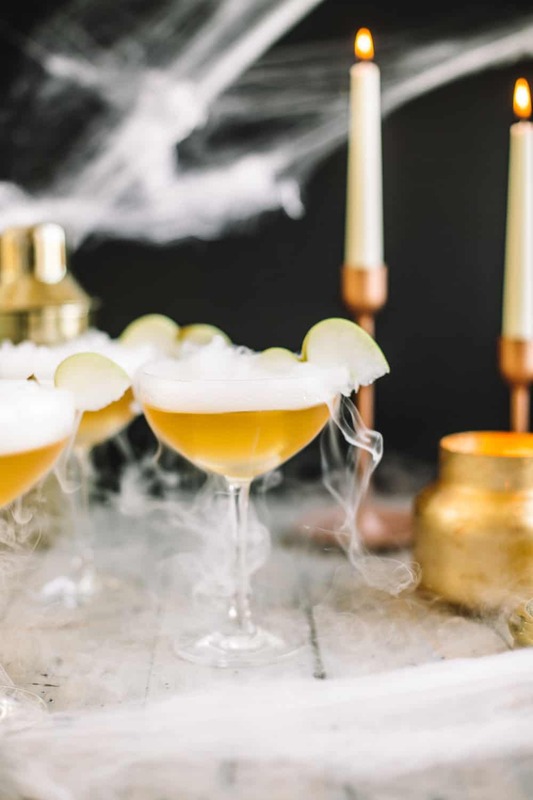 Top off with an ice cube sized chunk of dry ice and garnish with a green apple slice. These look amazing, can’t wait to see the rest! I also feel you ought to know I’m reading this wearing a Slytherin sweatshirt!